This course provides the fundamentals of how to engage an Business Positioning strategy for selected products. The products will be those targeted during a screening and scoping or feasibility study such as spices, tea and coffee. IP Business involves a serious six-step method in order to ensure income returns from final markets. IP Business instructs participant learners in the 6-step method. Participants in this level of training would learn analysis of the products’ distinctiveness and intangible value to consumers; analysis of the whole sale and retail price gap across final markets; a thorough analysis of the supply chain; legal and business strategies to intervene appropriately in the supply chain with a variety of methodologies, including licensing, certification marks, trademarks and other IP legal tools combined with business strategies. Most importantly, participants would learn how to engage IP business strategies that combine legal and business interventions such as creation of import and export companies, and marketing tools relevant to the supply chain analysis and most appropriate interventions by product, market and context. At this level, participants will be involved in projects relative to the distinctive products that are determined via the screening and scoping studies. The tools of IP Business integrate legal and business strategies and while they follow known business methods, each strategy is different, of course, depending on the product, the markets, the relative stakeholder, the condition of the supply and value chain, the opportunities in relevant markets, and investment opportunities. In Business Positioning 202, projects advance with the support of additional experts in marketing and law from the Position Business, Ltd team. At the most advance level, projects are in full-implementation form and there is additional focus here on training and building relevant stakeholder organizations, ownership and transference of knowledge. Stakeholder organization is critical to ensuring full ownership of the rights and benefits of the IP transferred back to rightful owners and producers of the distinctive products. Position Business Ltd strategic training varies by audience from Ministers and Permanent secretarial level policy-makers to sector-specific levels. The training needs at this level differ from training in products and focus instead on IPR policies including introduction of the link between African IP in foreign markets and government responsibilities for support and enforcement of all IP in domestic markets. The focus is to integrate Business Positioning into Economic Development. Trade and Export Promotion, Finance and Economic Development; plus sectors such as Agriculture, Industry, and Culture. The training needs here are in IP business 101 and 202 to enable mid and senior level staff from the above departments who play major roles in Africa tosupport IP business initiatives. Level of education and training include: IP business 101 & 202, plus Sector Training. Individual “field” IP stakeholders in Africa need to understand how their price and demand situation will be improved by IP business initiatives. The material covers IP business 101 and for select leaders, IP business 202. We begin with the distinctiveness and IP; strategies for capturing more income from export markets: comparative case studies to better appreciate the reasons for income gains and how farmers and producers can understand new price signals. We begin with improving understanding of markets outside country borders and how to access such markets via Business Positioning strategies. We discuss basics of forming export and import companies, articulating with their own companies to be formed in international markets. A major focus of farmer and producer training is the formation; communication and management of their own cooperative organizations and country-businesses. 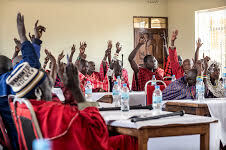 Farmers and producers are also trained in structures and membership creation such as how to vote on cooperative decisions on managing IP that are conveyed to the national stakeholder corporation. This training will involve creating and owning a distribution company; organizational membership and capacity building; management and group dynamics; detailed training in the specific business strategies, including directing business managers in retail markets.